Check my reviews!!! This is an immaculate, comfortable,1 bedroom, 1 bath condo newly renovated and updated in September. The condo sleeps four and has a queen size bed and queen sleeper.It is fully tiled and located directly on the beach on the Gulf of Mexico.Kitchen appliances are new upscale stainless steel with a new granite extended counter and new cabinets.Kitchen is equipped with a micro convention oven, stove with glass top, refrigerator, dishes, pots and pans, all utensils, blender, food processor and much more. Bathroom has new walk in tiled shower with double shower heads, new vanity and counter. Balcony has chaise lounge with table and 4 chairs. Direct view of sunsets and dolphins right from your own balcony. No need to drive to a beach. This direct access beachfront unit has additional amenities including, beach chairs, beach umbrella, beach toys for the kids ,rafts and swimming noodles. WIRELESS INTERNET so bring your laptop computer.The unit also has 2 Flat Screen TVs with DVD connections; one in the living room and one the bedroom. All linens, bath and beach towels, hair dryer ,iron, ironing board are included in unit. Laundry facilities are located on each floor and the Sunset Grille Restaurant and Beach Bar are on the first floor with direct access from the beach or the pool area. Fell in love with Marco Island on our first visit with my two sons and my husband.Views from the condo are breathtaking whether it is during the day looking at the dolphins and fish jumping out of the water or the sunsets in the evening right from the lanai. Newly renovated tiled bathroom with walk in shower and glass doors. New vanity and toilet. 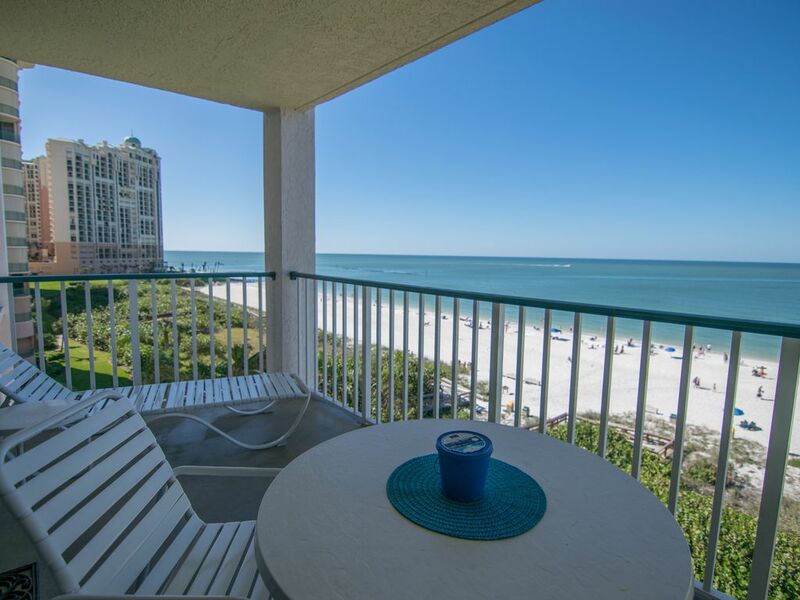 This condo is located directly on the beach overlooking the Gulf of Mexico. Breathtaking sunsets are visible right from your balcony. View the dolphins from your balcony in the condo. The condo association has a parking fee upon registration. There is a $25.00 fee and a $75.00 deposit for the transmitter refundable after departure. Must have credit card to pay this fee. WiFi capability in the unit. Beach chairs and beach towels are included in the condo. You may rent a bike on the island and secure a bike rack in the garage. The pool is adjacent to the beach in a private setting. Bathroom and shower facilities are located next to the pool area in the building. Located in the Apollo Condominium which has a new, beautifully decorated lobby,heated pool, jacuzzi, exercise room, laundry facilities, covered parking, tennis courts, restaurant and sports bar on premises with outdoor dining. You can swim in the Gulf and walk 200 feet to the pool and jacuzzi. Showers and bathroom facilities are conveniently located adjacent to the pool. Great view and everything you need. Nice updated kitchen. On small side but appropriate for price. Does need new mattress for pull out bed. The leather sofa bed with the mattress was just purchased 12 months ago. It may be thinner than a bed mattress but it is new and rarely been used in the past year since most of my rentals are for two people. Hopefully you enjoyed all the recent kitchen and bathroom renovations completed in October. Beautiful condo and a fantastic view of the sunset every night . When we pulled in we immediately noticed the security given for the people that stay on the property. We were welcomed by 2 nice young ladies that helped us get checked in and explained the process of the elevator keys and the pool and the condo unit iitself. When we walked in the unit the view was breath taking. The condo was beautiful and clean and the beach was so pretty and clear. We found so many new variety of shells and the restaurant below was nice to have close for dinners. Barbara (owner of the condo) was so kind and helpful and would surely recommend this place to our family and friends. Truly amazing !!! Thank you for taking the time to comment about your stay in my condo. Hopefully I rent to you again in the near future. This was a small but comfortable condo and Barbara was a kind hostess. Everything you could possibly need was furnished. You can never be disappointed with warm, sunny days in January! Thank you for enjoying the condo. Hopefully you will rent again.The weather is great. Nice location on the southern tip of the island. Close to many great places to eat. Unit was in very good condition, very safe and secure! This condo had everything we needed for our trip. I appreciated the dishes, the coffee filters, the towels and beach items. The condo was clean too and the area was quiet and relaxing. A great view and a great location. Would definitely stay again in the future! runners,parasailing, shell excursions, windsailing and canoeing. Boat rentals are available at the island marinas. Most of all....beautiful sunsets and great weather. The condo association charges a parking fee. Please refer to the listing for details. Excessive laundry of more than one basket excluding bed linens will result in a fee of $35.00.